We’ve speculated irresponsibly in the past about all the things laconic action star Keanu Reeves has, could, and should kill over the course of his violent career—John Wick Vs. Dracula, in theaters never—but we’ve never stopped to wonder whether he could take down the sentient toys of Pixar’s Toy Story universe. We can now add “plastic cowboys” and “that baby-spider abomination from under Sid’s bed” to the list of Reeves’ potential cinematic targets, though, as Deadline reports that the Matrix star has joined the cast of the upcoming Toy Story 4. 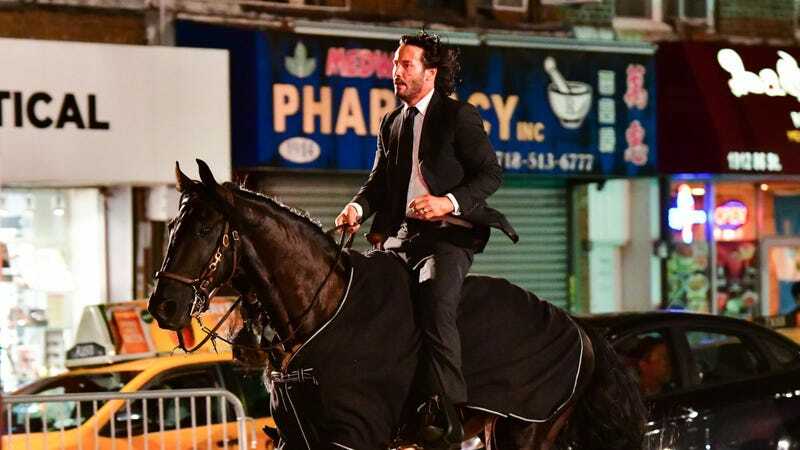 This news comes courtesy of franchise star Tim Allen, who took time out from his busy schedule of telling The Spooky Story Of The Allegedly Funny Conservative in order to mention that Keanu had signed on for the film. “Keanu Reeves has got a great part,” Allen effused on The Tonight Show, before noting that both he and his new co-star were a little worried the character was a bit too much like Allen’s cocky spaceman, Buzz Lightyear. The film’s directors, though, reminded them both that Reeves’ character is super-teensy, so nobody needs to get too upset or scared about their place inthe pecking order. Still, now it’s got us curious to try to figure out what sort of toy Reeves is playing, given that Allen is suggesting it’s only an inch or so tall: Army man? Lego minifig? Shopkins? He’s probably playing a Shopkins.